As a kid, I was what you’d call “Husky”. It’s interesting to me that “husky” was a size descriptions for a Sears brand of jeans called “Toughskins”, my new best friend and fashion statement. Luckily, I thinned out during middle and high school due to my participation in sports specifically basketball and football. During my junior year of high school, my parents purchased a car for me and paid for everything that the car required. Once my senior football season was completed, I decided it was time to claim some of the responsibility for maintaining my car. I gained employment with McDonald’s restaurants and proceeded to gain between 75 to 100 pounds within the nest two years. Also, I began two of my favorite pastimes during this time, eating and dating. It’s not that I dated in multiples but I Continued long term relationships with women who told me because of my 6’2” height that my ballooning weight made me look “thick” and “big-boned” (Have you ever seen a fat skeleton?). My body and I knew that this was not ture! I began to develop a list of health issues that divulged the truth: issues such as, diabetes, high blood pressure, high cholesterol, osteo-arthritis (shoulder and knees” and sleep apnea. ENOUGH IS ENOUGH!!!!! My primary doctor had previously suggested weight loss surgery. I immediately dismissed his suggestion believing I could lose the weight if I just worked harder at losing weight. One of my best friends had decided to have the gastric bypass surgery, I trusted hi opinion and I knew he would tell me all I needed to know about this surgery. After seeing his results, I decided to attend a session. I made my decision to pursue weight loss surgery after this session: however, my health plan wouldn’t pay for the surgery at this hospital. Once my plan told me the hospitals that would be covered, I narrowed my choice to George Washington University since it was a Cent of Excellence which led me to Dr. Afram’s Center of Obesity Surgery and his wonderful staff. I attended my first session with Dr. Afram and the team and I must say neither my wife nor I was impressed with the initial presentation. Subsequently, I became confident that this center was the right place for my surgery to be performed. 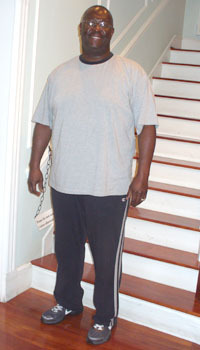 I was nearly 400 pounds at my peak but I loss weight and hovered around 300-325 for ten years prior to surgery. I weighted in at 310 prior to surgery (of course, I gained an additional 10 pounds before surgery). On September 4, 2013, my surgery was performed and I spent a few days at the hospital. My journey has been great with no setbacks at all. In 9 months, I’ve lost 103 pounds and feel great. My only complaint is my wife says that I shop more than she does, of course, that wasn’t my focus before surgery. It’s wonderful being able to go into any store and purchase clothes. 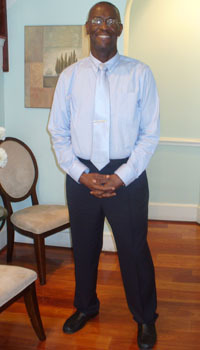 I couldn’t tell you how grateful I am to Dr Afram and his staff for the changes in my life that have been beneficial. My health is much better and my health conditions have diminished in severity. I don’t know where my journey will end but I’m thrilled with where we are now! !